It's Just the Coffee Talking: Coffee Talking - McDonalds Coffee. Where is it sourced from? Who supplies it? Is it Fair Trade? Organic? Coffee Talking - McDonalds Coffee. Where is it sourced from? Who supplies it? Is it Fair Trade? Organic? McDonalds Coffee. Where is it sourced from? Who supplies it? Is it Fair Trade? Organic? To be honest? I don't really care. Another coffee talking topic I stumbled upon without really trying to or having a big interest in it! But... with freshly brewed strong, hot coffee in front of me this morning, let's chat. 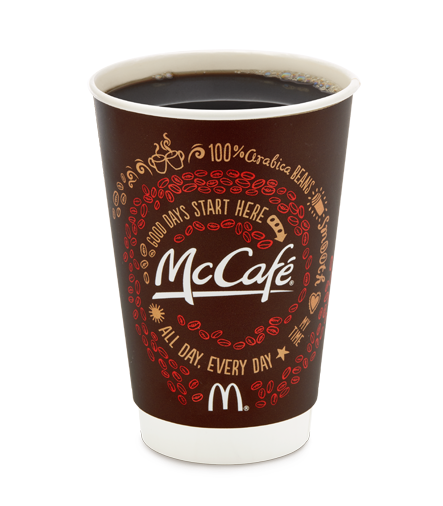 McDonald's coffee is made with 100% Arabica beans and freshly brewed every 30 minutes. Cool. I'm good knowing that. So, how come I stumbled upon more information? I thought about a friend of mine from Northern Minnesota. A memory popped in my head from about 14 or 15 years ago when she came to our house with her kids, I offered her freshly baked cookies and she declined because she had been detoxing her body of all sugar for two weeks. I offered just one cookie - she said she really couldn't because she had done SO well for two weeks with absolutely no sugar that she was rewarding herself by taking the kids to McDonalds after they left our house and they were getting one of the new cheesecake shakes. McDonalds at the time had run a huge TV and mailing campaign about this shake - I remember getting flyers in the mail about it and seeing the photos of it. A couple days later the kids and I popped in and got one ourselves. It was 'eh' ok. And since we rarely go to McDonalds, by the time we returned they didn't have those shakes anymore anyway and I hadn't thought about them again in, well, about 15 years. Until last night. So of course I started to wonder; was this in spring of 2000? 2001? We only lived there from 2000 - 2002 so McDonalds must have came out with this cheesecake shake between that time frame. And then I just HAD to look it up, because my brain is like that and I could not have slept if I didn't. Except I didn't find what I was looking for. What I did see what a brief blurb online about McDonalds coffee being Gavina Gourmet Coffee except on the upper East Coast of the USA where they instead served Green Mountain's Newman's Own Organics Blend. That completely knocked me on yet another course of thinking.... and here is what I found. McDonald's restaurants are partnering with Green Mountain Coffee Roasters Inc. to source, roast and package Newman's Own Organics Blend coffee exclusively for more than 650 McDonald's restaurants in Massachusetts, Connecticut, Rhode Island, Vermont, New Hampshire, Maine and Albany, NY. The new coffee will be available beginning Nov. 1. And I was thinking to myself; Why in the world would they feel the need to only serve one kind of coffee in 7 states while everyone else gets a different kind? And then I went to bed. So this morning, I looked that up again. I don't know that that is true any longer. I cannot find any information stating this is still true in 2015. All the information quoting the Newman's connection is dated back in 2005 and 2006 and just repeated by other sources. And McDonalds own website says their coffee is sourced from Gavina, no mention of 7 states currently getting a different blend. See below. 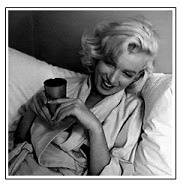 It's hard to beat the aroma of a fresh, steaming hot cup of coffee. When it's expertly made by a master-blender trained in the fine art of creating gourmet coffee, it tastes as good as it smells. Coffee has always been the Gaviña family's guiding passion. When Don Francisco Gaviña left Cuba and established a coffee roasting plant in Southern California, he fulfilled a life-long dream. His children grew up on the plantation, learned to live and love the coffee business at first hand, and Gaviña remains a family company rooted in traditional values. His son, Pedro Gaviña, says their motto is, "Everything we do, we should enjoy." Today, Gaviña's state of the art facility is located in Southern California. It's dedicated to creating gourmet coffee, innovative new coffee concepts, and, through their training program, teaching McDonald's employees the art of brewing great coffee. Gaviña prides itself on maintaining a green coffee department that's dedicated to sustainability. As Pedro Gaviña points out, "Coffee is the second-most traded commodity in the world, and the economy of over 50 countries depends on it. It is vital that we look after farmers and look after land, as without sustainability there is absolutely no future." Is your coffee responsibly grown? As of 2012, about 25% of our total global coffee bean purchases were from Rainforest Alliance Certified™, Fair Trade USA or UTZ Certified farms. The majority of our certified coffee purchases are from Rainforest Alliance Certified™ farms, including 100% of our espresso in the U.S. and Canada. This is moving us toward our goal of 100% verified sustainable coffee, both hot and iced, by 2020. Here in the U.S., in partnership with our franchisees along with McDonald’s Canada, we’re investing $6.5 million in a technical assistance program for our coffee farmers in Central America. Over the four and a half year program, we’re helping more than 13,000 coffee farmers produce more sustainably. The effect of the program is to help strengthen local economies and give farmers the resources they need to improve their crops, while preserving biodiversity. To be sure we’re meeting these goals, we’re using a scorecard to track the progress of our farmers’ crops and income as well as ensure they are complying with sustainable practices. Buying verified sustainable coffee. Globally in 2014, about 32% of our total coffee bean purchases were from Rainforest Alliance Certified™, Fair Trade USA or UTZ Certified farms. The majority of our certified coffee purchases are from Rainforest Alliance Certified™ farms, including 100% of our espresso in the U.S. and Canada, all McDonald’s coffee served in Brazil and all of our coffee in Australia and New Zealand. 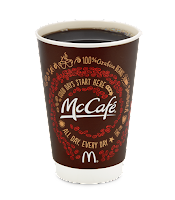 McDonald's markets in Europe source 100% of their coffee—with the exception of decaf—from farms that are Rainforest Alliance Certified, UTZ Certified or Fair Trade International. While our goal to advance coffee sustainability is global, our efforts begin locally. McDonald's is collaborating with TechnoServe, an international non-profit and leading provider of agricultural technical assistance, as well as SCAN (Sustainable Commodities Assistance Network), to train more than 14,000 farmers in Guatemala in sustainable coffee growing practices. Initial evaluation shows that the first cohort of 9,000 farmers are now implementing improved agricultural and business practices that have increased coffee yields by an average of more than 20%. This means higher incomes for farmers and more food for their families during the lean months that threaten most of the region’s coffee-producing families. These results were generated despite Coffee Rust disease, difficult weather conditions and fluctuating prices. Farmers are also being trained in best practices for staple food production and planting alternative crops to provide food for their families and to sell.